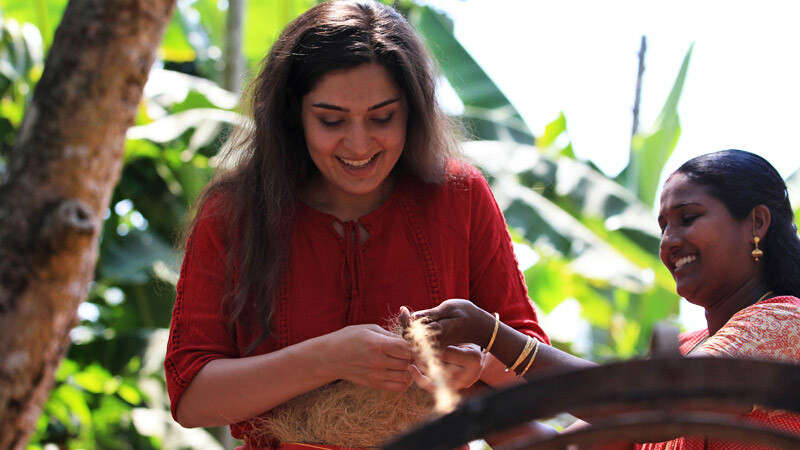 Responsible Tourism (RT) Mission lets travellers experience the compassion and craftsmanship of the serene, secluded villages of Kerala up close. These villages of God's Own Country are blessed with many small-scale traditional industries and skilled artisans. For instance, the handicrafts village of Thiruvananthapuram assures a unique ethnic hangout spot. 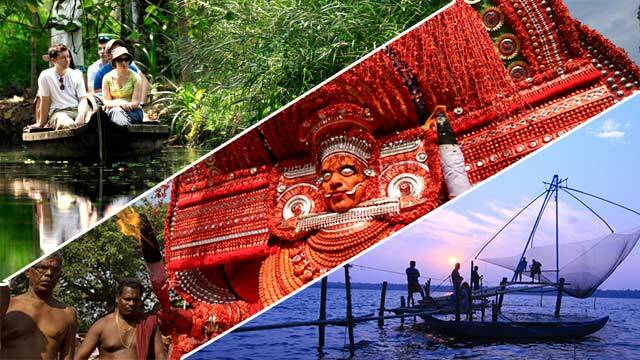 The tradition of Kerala, exquisitely crafted with beauty, renders a calming experience for visitors here. RT Mission packages inspire travellers to engage in many interesting activities that are part and parcel of typical village life. The Mission offers packages in such a way that travellers coming to Kerala leave with the warmth and compassion of the village life of God's Own Country embedded deep in their hearts. 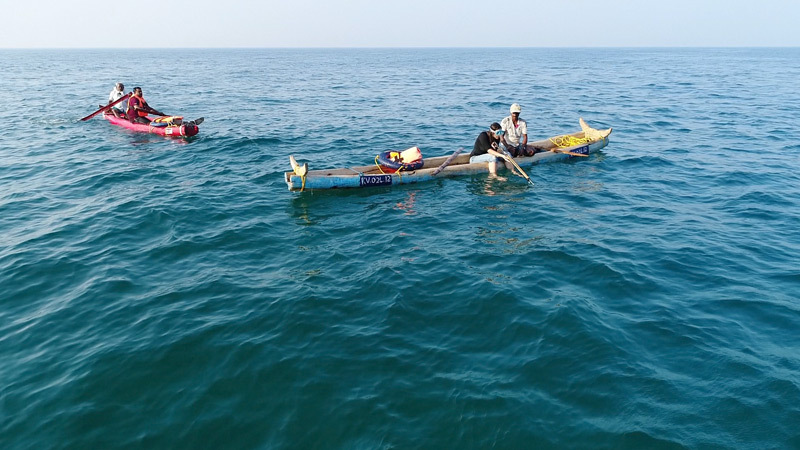 RT Mission offers packages through which one can watch and take part in the traditional ways of fishing and explore the livelihood of the fishermen as well. 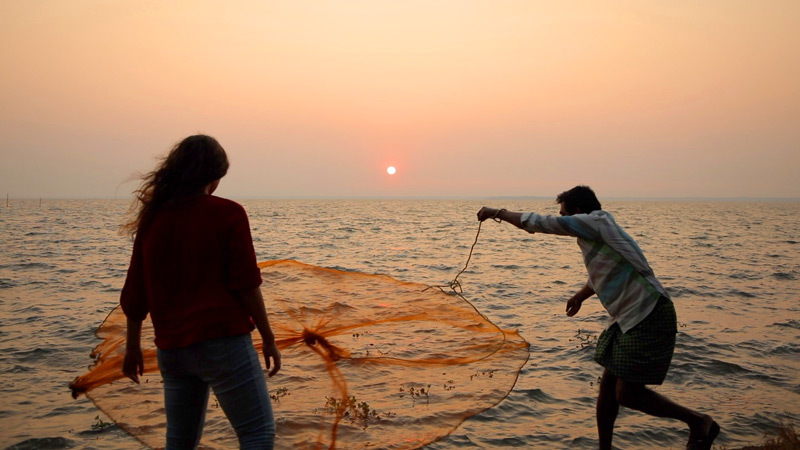 Get a chance to experience and explore the fishing methods practiced in Kerala such as the traditional Net Fishing and Chinese Net Fishing techniques. Net Fishing is the most common way of fishing practiced in our State. Learn some tips from the experts and catch some fish. 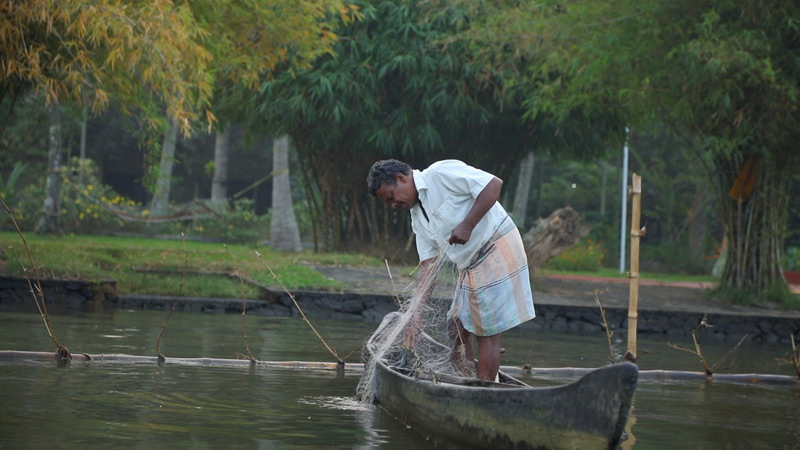 Engaging in fishing in the backwater destinations of Kerala is an experience worth a lifetime. Make sure you don’t miss it! Our traditional fishermen will show you how to fish with a bow and arrow. Have fun with this unique technique! 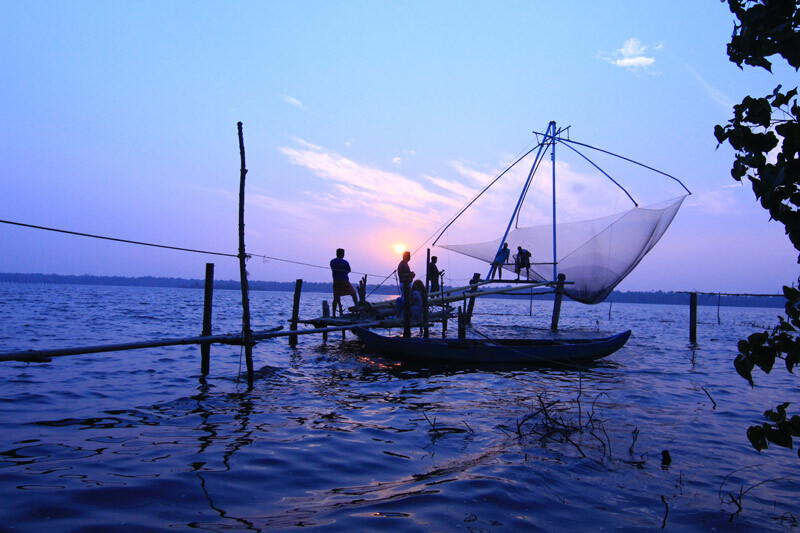 Chinese Net Fishing is a 500 years old fishing technique introduced in Kerala by Chinese explorers. These nets are unique in appearance and function and attract popular attention. RT Mission enables travellers to get up close with the functioning of Chinese fishing nets and allow them to do fishing with it to make their trip even more interesting. How can one think about Kerala without those long swaying coconut palm trees! Ever fancied climbing one? Don’t worry the wait is over, a chance to try climbing coconut trees awaits the guests of RT. 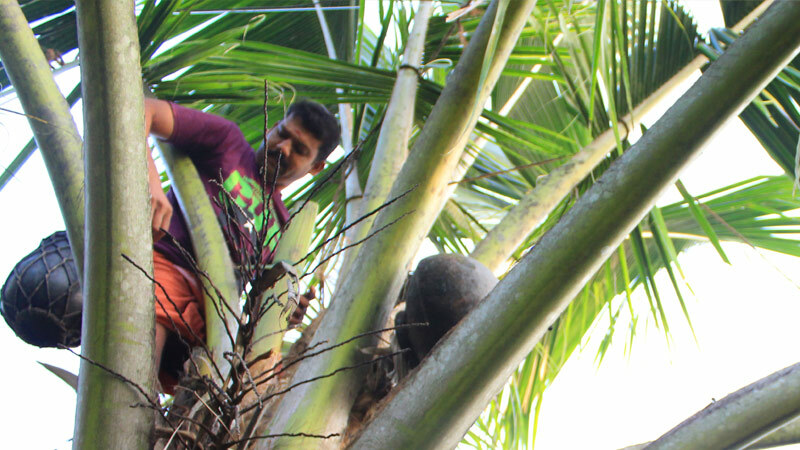 The activity lets tourists climb coconut trees with the assistance of experts. Our villagers are ready to show you the myriad ways of climbing them. 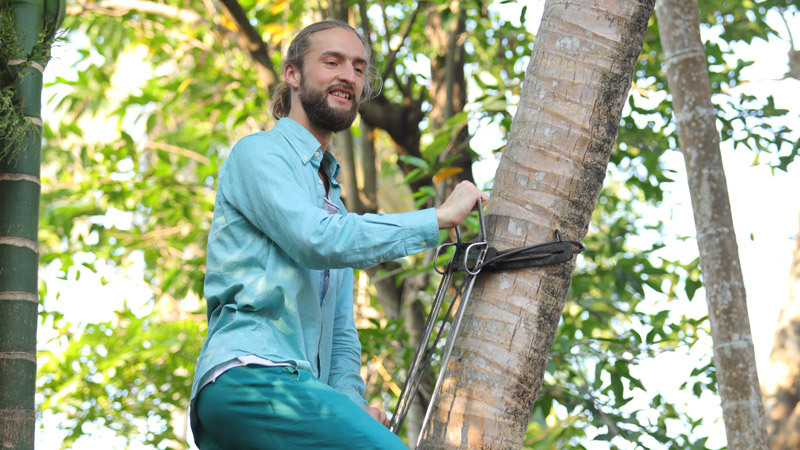 You can climb either the laborious traditional way using a thalappu or the modern way using the latest instruments. Choose your pick and enjoy yourself. Rubber tapping is now becoming a major form of livelihood in Kerala. Responsible Tourism Mission bestows tourists with a rubber tapping experience as well. A close encounter with the rubber tapping process is fascinating and at the same time enlightening too. Ever wondered how those beautiful Bamboo craft items are made? RT has the answer. The skilled artisans of Kerala are ready to teach you Bamboo crafts making. Take a look at the models of traditional houseboats, snake boats, home decor, and utensils and choose your pick. Bamboo products are environment-friendly and at the same time beautiful and user-friendly. 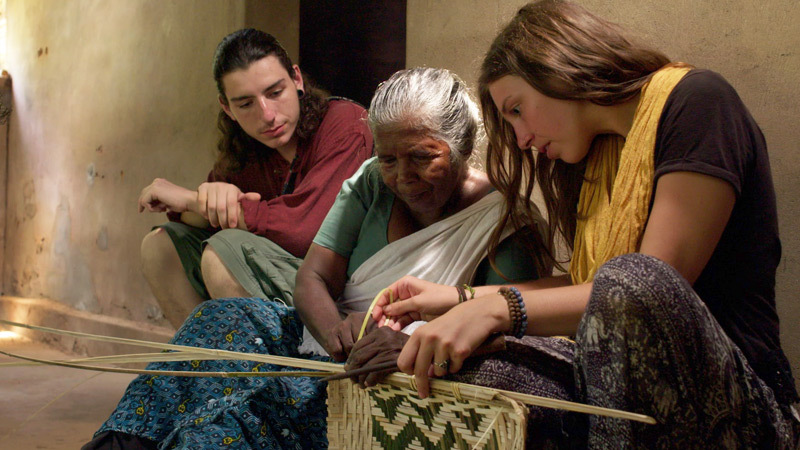 Learn to make those beautiful Kotta and Vatti (baskets) and take one home with you. The leaves of coconut trees are used to thatch the roofs of homes in the villages of Kerala. These are woven into beautiful thatch models. These leaves provide very efficient thermal insulation to houses. 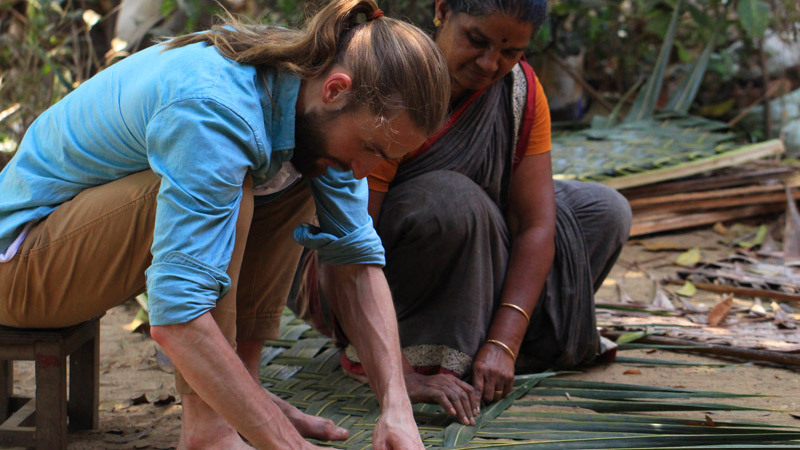 Watching the deft expertise of the villagers at weaving the palms fronds will tempt you to take a shot at it. 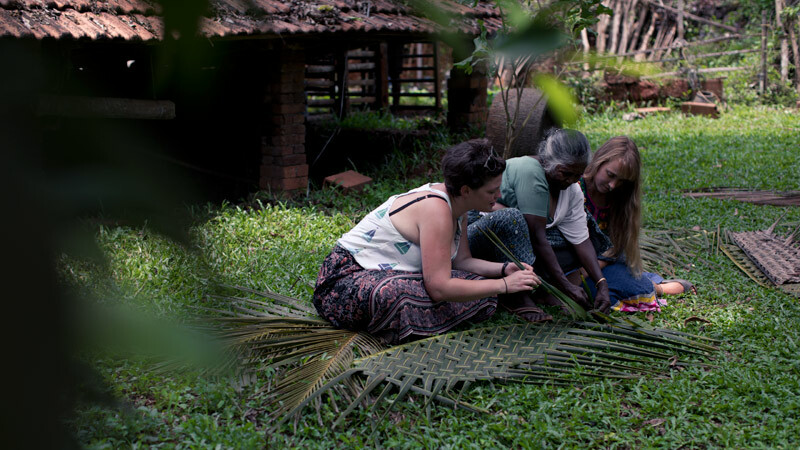 Weaving of screwpine leaves to make incredibly attractive handicraft mats is an exclusive scene from Kerala. This 800-year-old craft is mostly practiced by the women in the State. In ancient times these mats played a crucial role in the household needs of Keralaites. These were used to make beds, door mats, wall hangings and so forth. Come discover the tricks of making these beautiful items. The pottery villages of God’s Own Country are storehouses of ancient culture and legacy. 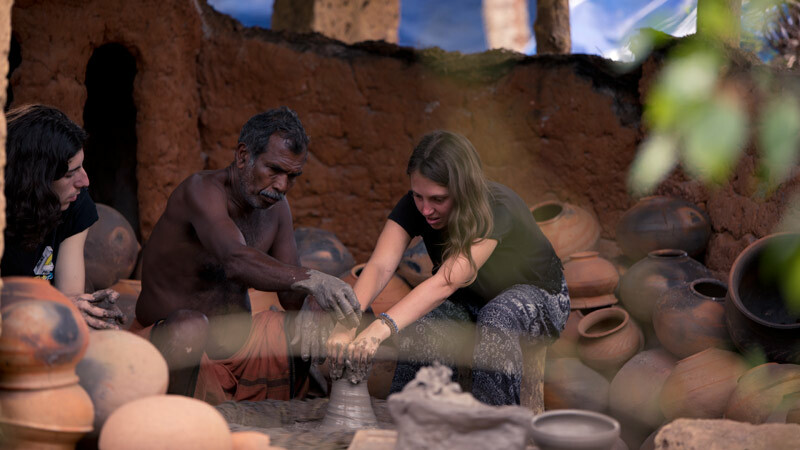 One can experience the traditional ways of pottery making and can participate in the process too. The way the skilled craftsmen of Kerala mould clay to make attractive pottery will surely surprise you. Come, take home with you the freshness of village life and the smell of the raw earth. Come learn the traditional method of weaving clothes. 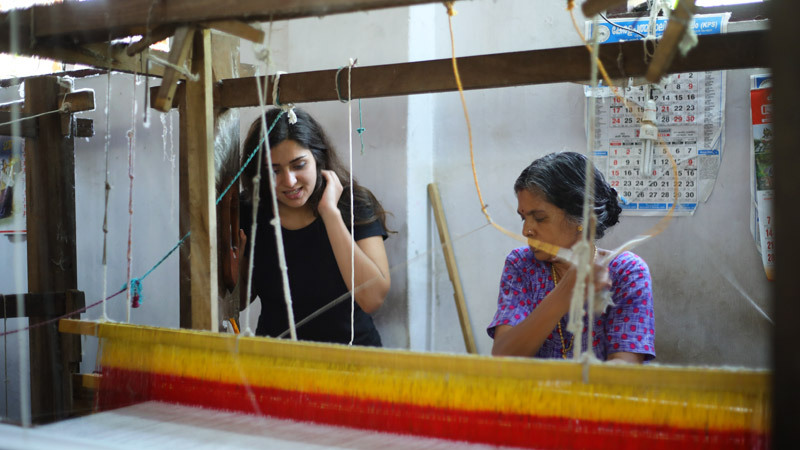 Kerala, renowned for its handloom industries, is home to some of the special attires that are exclusively made in the State such as Set Saree and Mundu. These products of Kerala are famous and have immense demand in the global market. The very sight of its making itself teaches you its prominence and elegance. The art of coir making has been practiced in Kerala since time immemorial. RT Mission lets you enjoy the making of coir and also lets you get involved in its production. 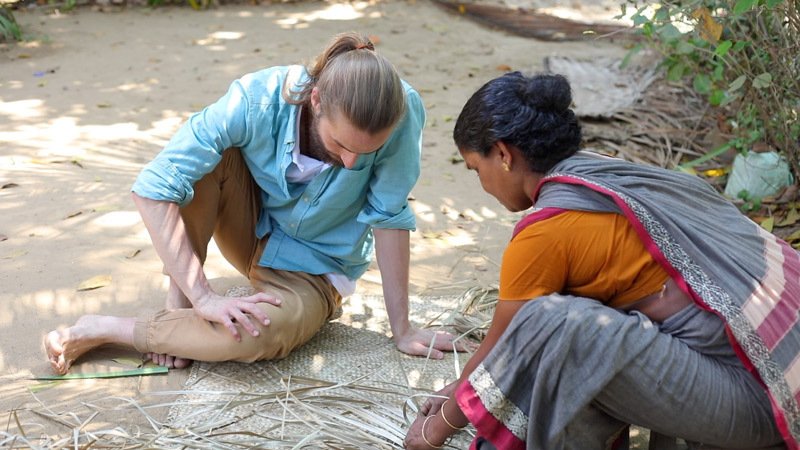 You will get to watch how the women of Kerala villages engage themselves in the production of coir for a livelihood. Coconut fiber is used for making products such as floor mats, doormats, brushes and mattresses. The taste of the Kerala brew – Toddy is famous all over the world. RT Mission gives you a chance to experience its making and relish its flavours as well. A usual scene from the backwaters of Kerala is that of lime shells being extruded. Travellers can also take part in this work with the help of Responsibe Tourism Mission. The Village Life Experience packages of the Mission helps travellers become a part of this. Handicraft making of Kerala is world renowned. Exquisite and intricate are the handicraft products of the State. Many souvenirs, culturally relevant and other home decors, are handmade here. One among them is the Anachamayam. These are the ornaments used to decorate elephants during the festival season. The very sight of the product itself will bring wonder to your eyes with its beauty and elegance. 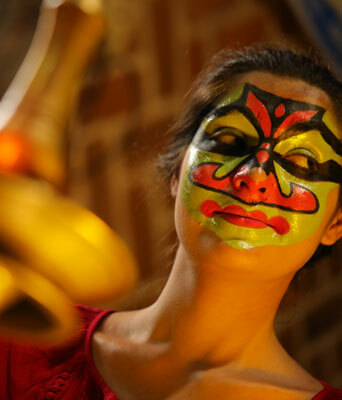 Do you want to add a little more fun to your trip to Kerala? Then you should never miss the crab and prawns catching activity. 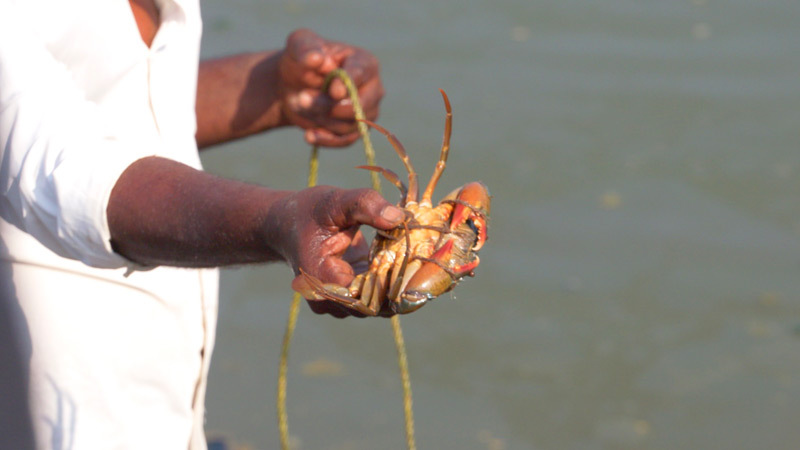 Fishermen of Kerala will teach you the technique of crab catching. Try your luck. It will be fun for sure. Bell metal making is an ancient form of art from God’s Own Country. 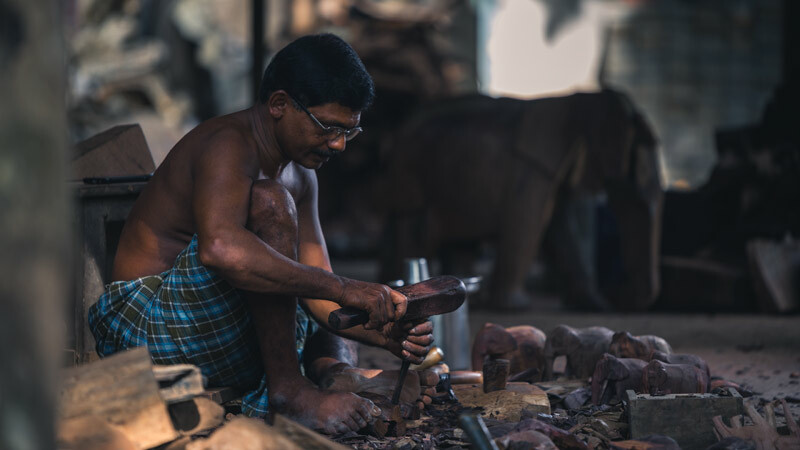 Artisans skilled in this make lamps, temple bells and different types of cooking vessels, like the magnificent 'Varpu', tumblers for drinking etc. with a hard alloy called bell metal. If you wish to find out the secrets of bell metal making, then visit Kerala and take a tour with the RT Mission initiative here. Kunhimangalam in Kannur awaits to share its secrets with you! Ever wondered how the metal weapons/tools of Kerala are made? RT is ready to surprise you with the art of making metal tools. 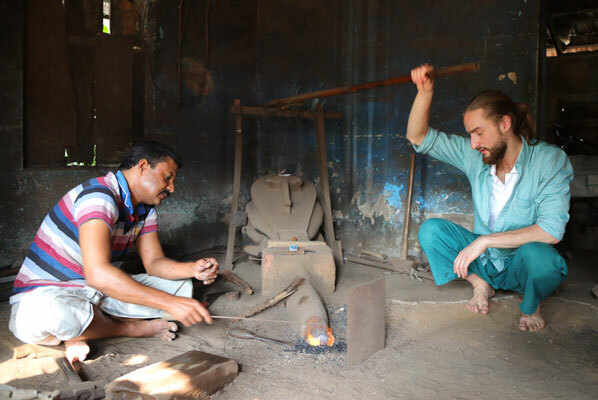 Traditional blacksmiths of Kerala will show you their craft. 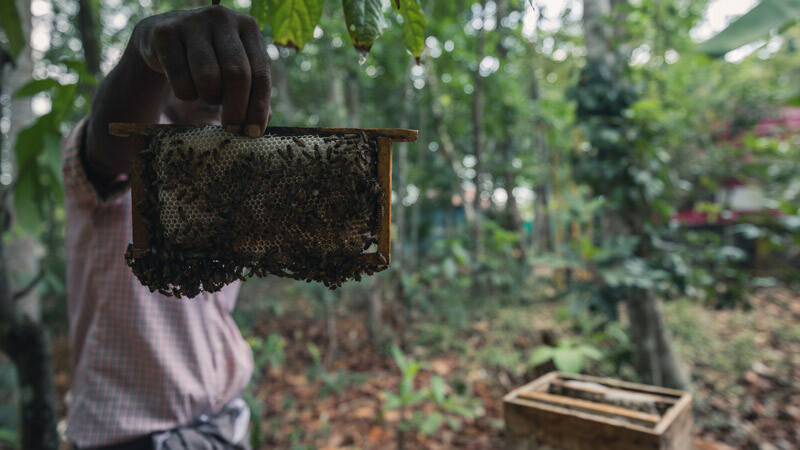 Bee-keeping is popular among the villagers of Kerala. A visit to the beehive farms will let you taste the purest of honey right from the heart of Mother Earth. Learn about beehives, honey extraction and taste the surprise that is hidden deep inside the hexagonal prismatic cells of beehives. Pepper production in Kerala was world renowned in ancient times. This ‘black gold’ played a crucial role in the history of ancient India. The cultivation of this King of Spices is something that you should never miss as a walk through these agricultural lands will narrate to you tales from the past. This spice that is produced in Kerala is now a supreme component of European kitchens. 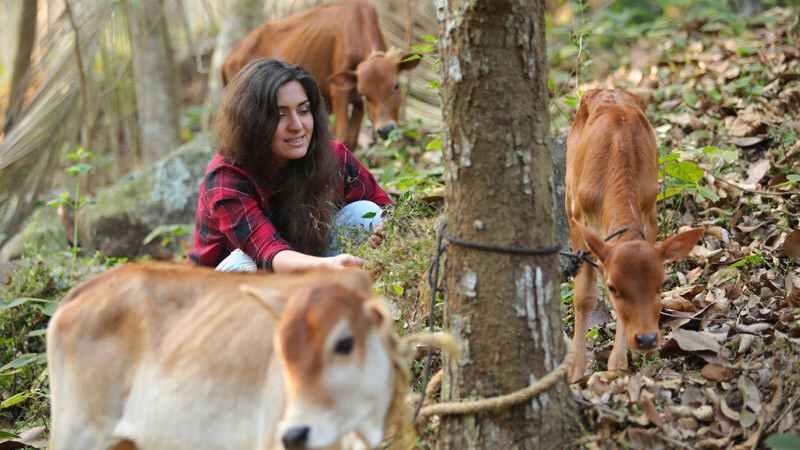 Responsible Tourism Mission offers packages that let travellers experience dairy farms. You can watch different varities of cows and how they are nurtured in a farm. Responsible Tourism Missions tour packages include experiences that every animal lover wishes to encounter. One such experience is that of visiting a goat farm. 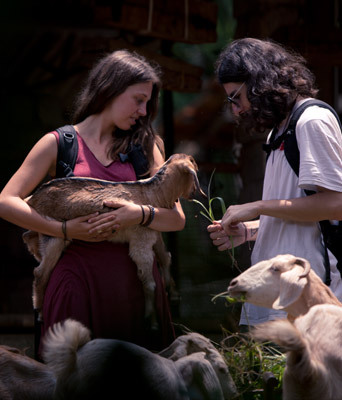 Spend some time with the playful little animals and learn more about goat farms and the way in which goats are nurtured. Rabbits never fail to catch your attention with their charm and innocence. 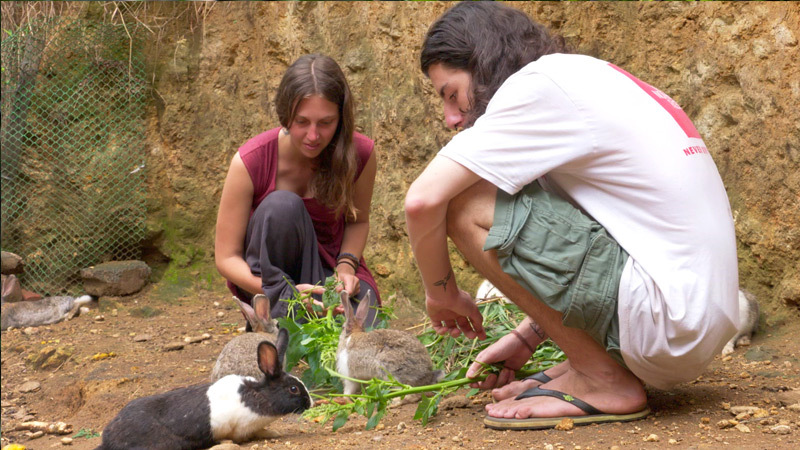 In Kerala rabbit farming is currently one of the biggest forms of livelihood in villages. What can be more exciting than a visit to rabbit farms to watch those little bunnies?! 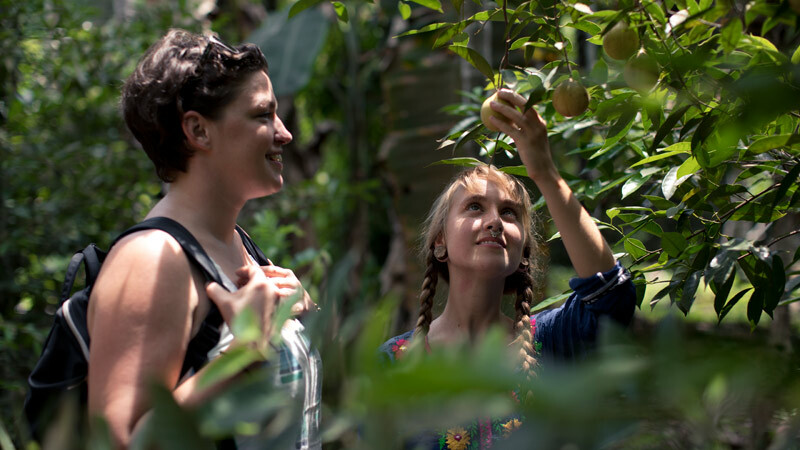 Get a chance to visit plantations rich with fruits and vegetables. Agriculture is the main source of income for the villages in Kerala. RT Mission will take you on a trip through the lush green agricultural lands of Kerala that are abundant with fresh fruits, veggies and spices. Join hands with the farmers of Kerala and learn about their farming techniques. 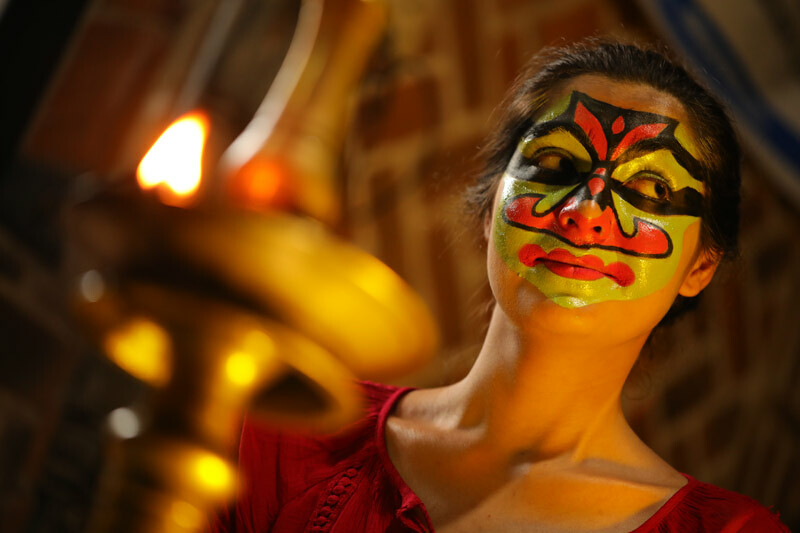 The cultural experience packages of the Responsible Tourism Mission offer the opportunity to watch the traditional artforms and rituals of Kerala such as Kathakali, Theeyattu, Garudan Thookkam, Theyyam and so forth. 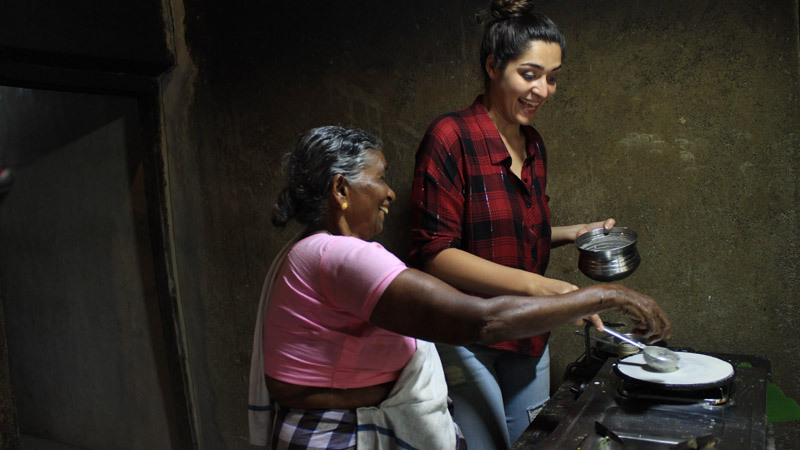 With the help of womenfolk in the villages feel free to try your hand at making indigenous Kerala dishes. Kalaripayattu is a traditional martial art form in Kerala. RT offers you a chance to learn some ‘adavau’ (Kalari steps). 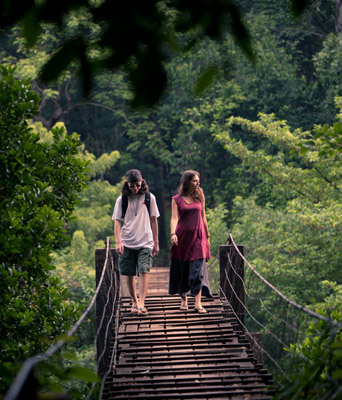 Learn some Kalari steps before leaving Kerala.